Hosting a truly wide range of activities, events and communities – Bellurgan Park’s unique and intact house & woodlands provides the perfect place for people to reconnect. Bellurgan Park is an ideal venue for weddings. As with everything we do, the objective is to make the occasion memorable and special. Airsoft is an competitive outdoor group activity, Anyone from ages 13 and up can participate, it doesn’t matter what gender or level of physical fitness you have, everyone can enjoy it. Similar to paintball, Airsoft is a team sport and players will learn quickly if they want to win they will have to work together. Oak Tree Stables is situated alongside Bellurgan Park, with 200 acres of beautiful countryside and 200 acres of ancient woodland at the foot of the Cooley Peninsula. This is an ideal location for horse riding, trekking and livery catering for all levels from beginners through advanced. We offer our clients the most wonderful trekking experience across 250 acres of our private land and through the Cooley Mountains, providing truly breathtaking views of the surrounding countryside. Bellurgan Park is home to an excellent red graded cross country trail and pump track. Bellurgan Park has also been the venue for many races such as the First tracks Enduro Cup, Bull raid and Irish XC champs. MTB TRAILS ARE CURRENTLY CLOSED! Bellurgan Park is the perfect place for your stag or hen, with our all inclusive packages we make it quick and simple to make your life easy. Choose from a range of activities from the adrenaline rush of airsoft to relaxing high tea on the front lawn. 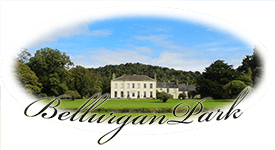 Bellurgan Park is the ideal venue for weddings, corporate events, parties, location hire, seminars and workshops. As with everything we do, the objective is to make the occasion memorable and special. Set within it’s own 390 acres of land, the 18th century house, with it’s completely original features, proves an incomparable and idealistic location. We guarantee privacy, discretion and class. Bellurgan Park is flexible and versatile, every event is as unique as the venue itself. It creates an impressive setting for that special occasion as well as stunning location for those photographic memories.